As a teacher and a chess coach and a fan of being a rational human being, there aren’t many academic pursuits that I value much more than logic. Children actually need to exercise their executive functions - the ability to control their own mind. They aren’t born with the ability to masterfully resist their impulses and weigh the potential consequences of their actions. For that reason, learning logic through games is not only a lot of fun, it truly grows an incredibly useful skillset. I once had a teacher who pointed out to me that asking the questions your teacher was just about to answer is a sign of being gifted. Maybe that was just a very nice way of telling me to shut up, but I still think that following the logical chain of progression in your mind is a very valuable skill for children. It can be applied to our everyday lives as a way to predict the future, make rational decisions, solve problems, and limit our mistakes. Sometimes we take for granted just how important logic is - and how it is actually a learned skill. Oftentimes a logical person will mistake it for “common sense.” Parents and teachers can very easily fall into this trap. As in, “How could you fail that science test, every question was just common sense” or “How could you not foresee that using a rock for a baseball with your sister was a bad idea?” But logic simply must be developed through experience and through practice. I absolutely love playing logic games. I’ve always enjoyed solving problems, and ever since I was little I have loved things like the classic grid logic puzzles and board games that required deduction. I still have vivid childhood memories of what felt like very complex mental acrobatics while playing games like Clue and Mastermind. And I have no doubt those games served me well. Now my wife and I have two little ones (6 and 2) and our son is a little logic machine. He’s got the kind of brain that’s hard to shut down at night because it’s constantly running. And he has the lovely habit of constantly looking for mistakes everywhere and wanting to solve every problem he sees like his old man (sorry, Honey). I love playing the games in this list with him, and many of them are well-suited for independent play while traveling or sitting in a restaurant. And every time we play them I’m certain there are new little synapses being built and firing in his brain every day. Disclosure: Some of the links in this article are affiliate links. Clicking on the images and names of games will take you to view the game’s listing on Amazon.com. Clue might be the logic game I have the most nostalgia for, and it’s still one of the best in my opinion. 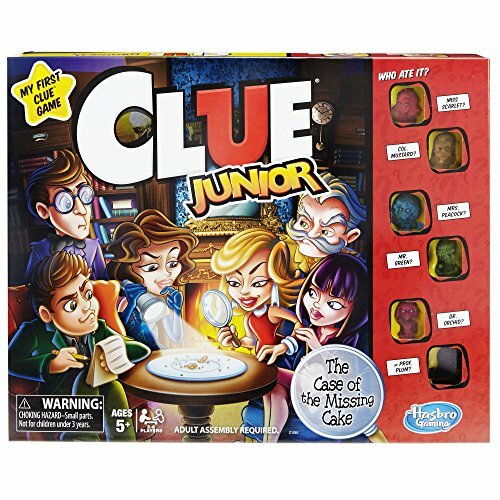 Clue Junior is what I would call the perfect gateway to logic for the little ones. Of course classic Clue’s theme may be a bit much for the youngest kids, so instead of solving who committed the murder with which object, you’re solving who ate the cake with which drink. You don’t get the full blown experience of the logic found in Clue - like strategically making a guess each round and using deduction based on the responses you receive from the other players - but kids are introduced to the basic concepts of deduction, secretly keeping track of the clues you’ve gathered on paper, and eliminating answers until you’re left with only one possibility. I would start here at age 4 or 5 and move on to the regular Clue when ready. Another fantastic classic game from Hasbro that I have very fond memories of. Guess Who? ramps up the logic by tossing in the strategic element of choosing your own questions - hopefully questions that eliminate as many potential people as possible. There’s also another children’s version of this game with multiple themes to choose from that we enjoy with our kids today. There’s really productive learning to be done here. Imagine the connections being made. 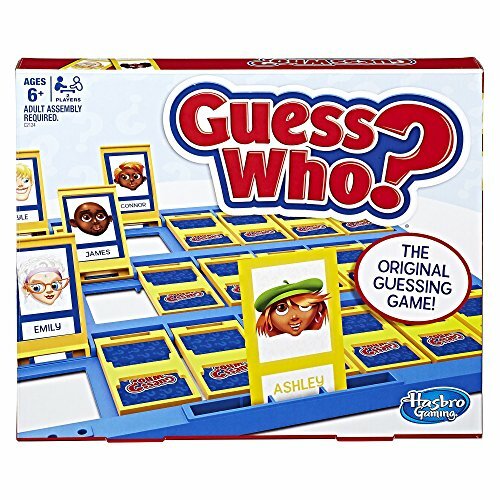 You aren’t born knowing that your first question shouldn’t be “Is your person named Ashley?” But soon your kids are searching for attributes that could eliminate roughly half or more of their remaining people, and they’re well on their way to logic town. I am 100% certain that my son’s favorite thing about this game is that it comes with a laser. Sometimes he just wants to play with the laser and have the dog chase it, and sometimes he wants to bring the laser to bed. 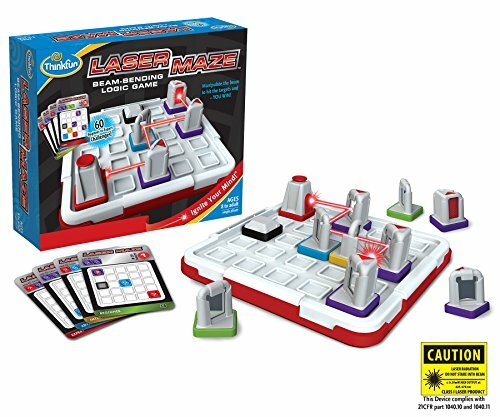 But don’t let the fact that the laser is the coolest part distract you from the fact that this is a well-designed and very fun set of puzzles. ThinkFun has certainly made a name for themselves with logic games. There are many great things about ThinkFun games. They always provide a wide range of difficulty levels, and the puzzles themselves are always a really fun challenge. But the best part of all is that they always seem to bring it with innovation and creativity. 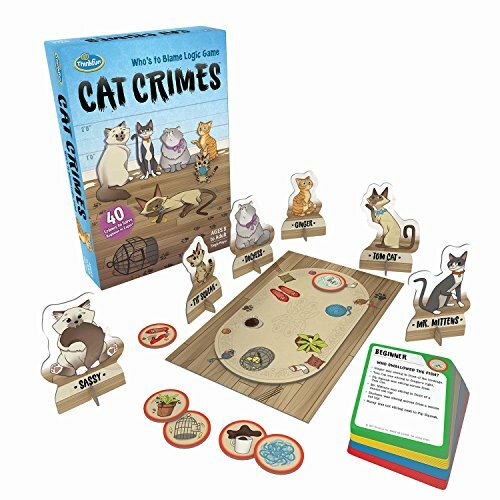 Cat Crimes is a case of a very creative theme. As a dad of kids aged 6 and 2 - both very big cat fans - I knew this one would be a hit. The cat designs are adorable and our littlest just wants to look at them while big brother and I solve the puzzles. One of the cats committed a crime - like eating the goldfish - and it’s up to you to figure out which one did it. The spatial clues are listed out on a card and you have to arrange the cats accordingly to figure out who the culprit was. Reading is required, so our 6-year-old can’t play entirely independently yet. But it’s a blast to play together, reading the clues out loud and using spatial reasoning and logic to organize these cats around the table. We recently claimed this game would make a perfect stocking stuffer on our holiday gift guide, and for good reason. The fantasy theme is right up our alley, and the presentation is really well done. We love the tin that it comes in, and the metal lid is actually used as your game board for the magnets inside. The only other thing inside is the nice spiral book with all of the puzzles and answers. Each puzzle is a well crafted question of “who belongs in which room?”. Other than the fantastic deduction involved, the really cool thing about this game is that there is no reading required. Younger children can play this game completely independently, because the clues are all in picture form. For instance there might be a picture of the king above the wizard, or there might be a picture of the knight standing in the kitchen. Our son was hooked on this one really quickly and did his best to blaze through the entire book the first night. Pure deduction is on display here and I really love watching him play Logic Land. I’m a big fan of chess and as a coach I’m also always looking for fun ways to practice the spatial awareness and board vision that is required to be successful in the game. This isn’t just a good chess tool though. It’s a really fun challenge even for non-players. Solitaire Chess is very similar to the old peg game where you hop pegs over each other until there is only one left. In this version all of the chess pieces move how they do in chess, and every move you make must be a capture. If you’re left with more than one piece and don’t have any more captures you can make, then you have to start over. If you make a capture every move and end up with only 1 piece, then you win. If you approach this game like a chess position - trying to solve the entire puzzle in your head without touching any of the pieces - you will certainly see the incredibly beneficial and challenging logic involved. Just like chess, this is the type of game that has you planning out your moves, thinking ahead, and evaluating the consequences of your actions. There’s nothing like the real thing. In many ways, chess is the ultimate teaching tool for a wide variety of life skills - impulse control, problem solving, responsibility, cause and effect, and, of course, logic. The benefits of chess have been studied in several different studies, and the results are very impressive. Not only has chess been shown to raise math and science scores, but reading scores as well. Put simply, chess is the ultimate game and one of the very best tools there is for training executive functions. 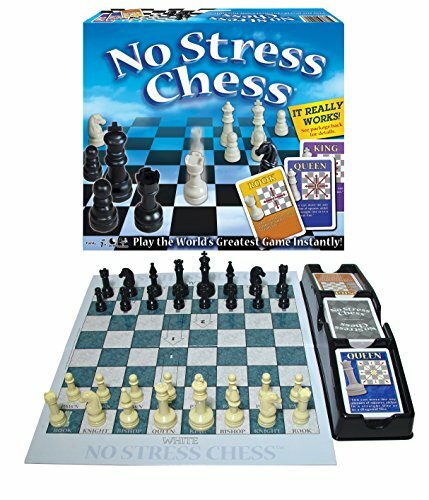 I recommend No Stress Chess because it’s a great teaching tool, and a fun variant to play even for seasoned veterans. You can just use it as a normal chess set, or you can use the provided cards to teach beginners and to level the playing field. If you draw a knight card you must move a knight. This makes it easier for beginners to decide what to do, and it restricts the choices of veterans. 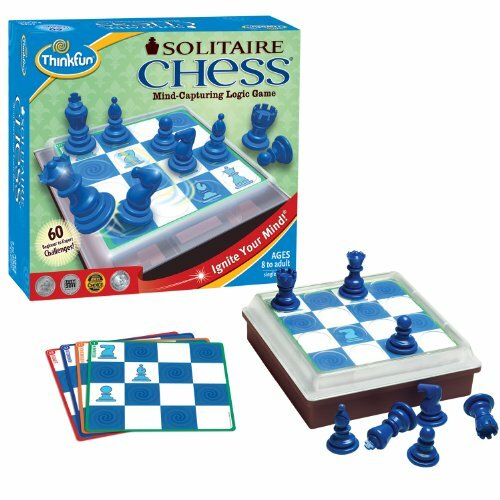 This can make it a great choice for playing chess with the little ones. While you’re working your way up to the real thing, you’re still reaping the incredible benefits of the calculation and analysis of different options in front of you. While I’m a huge proponent of the benefits of chess, this is a list specifically about logic, and Mastermind simply must stand on the top of the mountain. 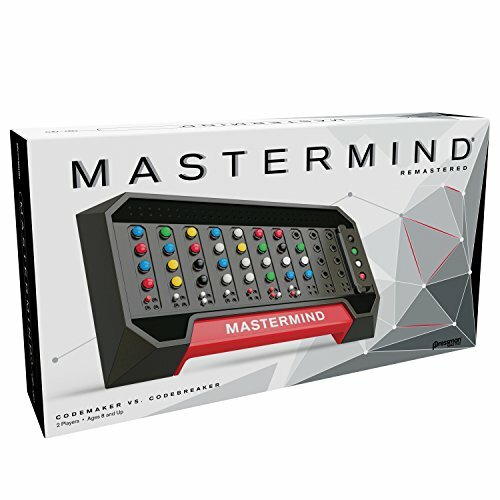 Mastermind is the purest game of logic and deduction that exists. This is the game that boggled my mind as a child as I tried to crack my parents’ code. My eyes would flick back and forth between my attempts as I tried to understand the connections. What knowledge had I gained from my previous attempts? Which colors can I rule out for certain? What guess will provide me with the most useful new knowledge? These connections are powerful. Kids are reaching back into previously learned information and combining these lessons into a fuller understanding. It’s crystal clear that the tiniest dip into thought processes like that are a big deal for young kids. I grew up with a Disney version of Mastermind, where you had Disney characters instead of colored pegs, and you only had 3 pieces in your code instead of 4. Today we also own Mastermind for Kids - another version that uses animals and only has 3 pieces of code. But we play the classic edition of Mastermind with our 6-year-old now. He loves cracking the codes, but he also gets a really big kick out of being the code maker - and as I crack his code I like to say my entire thought process out loud. Do you play any of these games with your children? Did you have any of them when you were little? 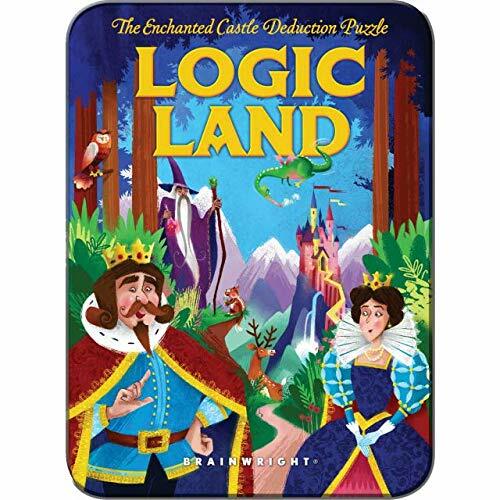 Did we miss any of your favorite games of deduction and logic? Let us know in the comments.